There were two Burget families pioneer in Fayette.Co.IA. John Burget 1810/OH-1885/Fayette.IA x Leah Bradford 1815/VA-1890/Fayette.IA, in the Fayette/Dunham Grove area. George Burgett 1832/OH-1911/Arlington.area x Cordela Adeline Bullis 1848/IL-?/?, in the Taylorville/Arlington area. The two families have not been linked together as of the last page uploading. Page Chronology: 2012Nov09, initially uploaded along with the Spatcher page. Burget Bertha A Crandal Burget John Wesley 1869/Wesfield.Twp-1948/Fayette.IA 27 Dec 1877 10 Sep 1976 Grandview Fayette Sec D, lot 337, N side, burial #2941. Dau of Wallace Crandall ?/?-?/? & Mary E. Jennings 1856/Illyria.Twp-?/? Ch; Bernice, DorisL, Chrystal. Burget Clara Christina Sampson Burget Donals 1902/Center.Twp-1985/Ankeny.IA Jan 15, 1906 Dec 5, 1994 Grandview Fayette Sec D, lot 338, burial #3289. Need parents. Ch; RobertL, Betth, Ronald, David, HelenJo, Barbara, Dorothy. Burget Donald Clyde Burget Sampson Clara Christina 1906/Clermont.area-1994/Ankey.IA 1902 Mar 17, 1985 Grandview Fayette Sec D, lot 338, , burial #3126. Son of Lewis Edwin Burget 1865/IN-1936/Westfield.Twp & Josphine 'Josie' May Skinner-Spatcher 1868/Fay.Co.IA-1949/Fayette.IA. Ch; RobertL, Betth, Ronald, David, HelenJo, Barbara, Dorothy. Burget Doris Lucille Burget Burget dau of John W. 15 Jan 1905 8 May 1918 Grandview Fayette Sec D, lot 337, 5ft from N side, burial #1238. 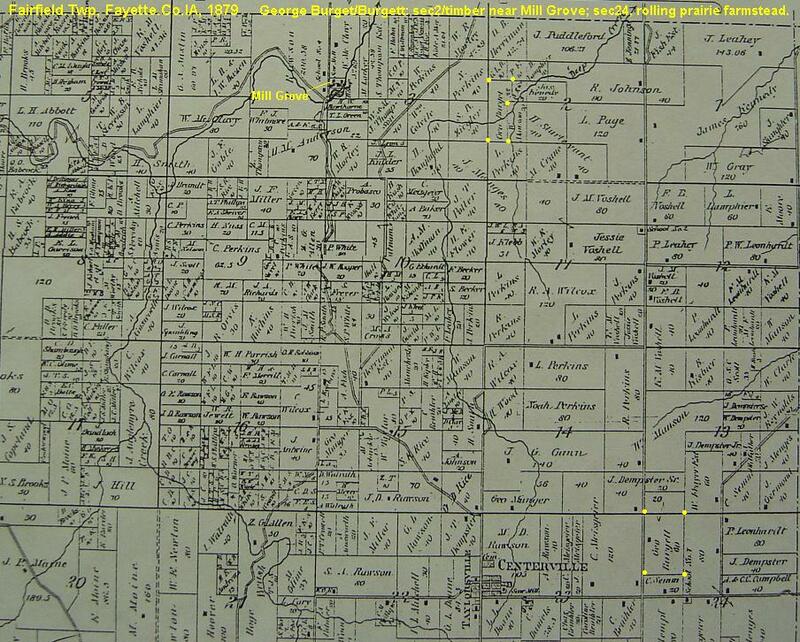 Dau of John Welsey Burget 1869/Westfield.Twp-1948/Fayette.IA & Bertha A. Crandall 1877/Elgin.IA -1976/Oelwein.IA. Burget Eli Lewis Burget Ashby Mary Matilida 1847/IN-1939Fayette.IA 21 Nov 1843 12 Oct 1927 Grandview Fayette Sec D, lot 335, burial #1495. Son of John Burget 1810/OH-1885/Fayette.IA & Leah Bradford 1815/VA-1890/Fayette.IA. Ch; Lewis Edwin, John Wesley, ErnestM, NellieM. Burget Ernest M. Burget Burget son of Eli 2 Jul 1871 31 Dec 1886 Grandview Fayette Sec B, lot 219, burial #478. Son of Eli Lewis Burget 1843/IN-1927/Fayette.IA & Mary Matilda Ashby 1847/IN-1939/Fayete.IA. Burget John Wesley Burget Crandall Bertha A. 1877/Elgin.IA-1976/Fay.Co.IA 22 Apr 1869 14 Oct 1948 Grandview Fayette Sec D, lot 337, burial #2178. Son of Eli Lewis Burget 1843/IN-1927/Fayette.IA & Mary Matilda Ashby 1847/IN-1939/Fayete.IA. Ch; Bernice, DorisL, Chrystal. Burget John Burget Bradford Leah 1815/VA (orMD? )-1890/Fayette.IA Jan 9, 1810 19 Nov 1885 Grandview Fayette Sec B, lot 219. burial #458. Age 75y10m10d. Son of George Burgett 1774/?-1825/Franklin.Co.OH & Hulda Unknown ?/?-?/? Ch; JohnW, EliL, Caroline May Carrie, Unknown, Mary Jane. Burget Josphine 'Josie' May Spatcher Burget Lewis Edwin 1865/IN-1936/Westfield.Twp 14 Aug 1868 9 Mar 1949 Grandview Fayette Sec D, lot 338, 2nd from N, burial #2189. Ch; ThelmaP, HarleyL, Donald Clyde, Harold Clifford. Father listed as John Spatcher (1821Eng-1907/1910/IL?, see Spatcher webpage, bz/2012) in obits and Ancestry. Mother was Martha J. Taylor 1830/CT-1897/Swaledale.IA, the 2nd wife of John Spatcher. Martha's 1st husb being an Unknown Skinner who likely died abt 1868 & was possibley the father of Josie May, with John Spatcher being a step father? ?, bz/2010-2012. Burget Leah Bradford Burget John 1810/OH-1885/Fayette.IA 1815 12 Jan 1890 Grandview Fayette Sec B, Lot 219, burial #544 Age 74y. Dau of Elisha Bradford ?/?-?/? & Sally Scofield ?/?-?/?. Ch; JohnW, EliL, Caroline May Carrie, Unknown, Mary Jane. Burget Lewis Edwin Burget Spatcher Jospehine May 'Josie' 1868/Fay.Co.IA-1949/Fayette.IA. 11 Apr 1865 7 May 1936 Grandview Fayette Sec D, lot 338, N side, burial, #1729. Son of Eli Lewis Burget 1843/IN-1927/Fayette.IA & Mary Matilda Ashby 1847/IN-1939/Fayete.IA. Listed Lorin Edw in Grandview burial book, bz/2012. Ch; ThelmaP, HarleyL, Donald Clyde, Harold Clifford. Burget Andrew E Burget Burget son of George 17 Jan 1867 22 Oct 1887 Taylorsville Fairfield Twp Son of George Burget 1832/OH-1911/Fairfield.Twp & Cordelia Bullis 1848/Rockord.IL-?/? Burget George Burgett Bullis Cordelia 1848/Rockord.IL-?/IA (burial?) 24 Jun 1832 26 Jan 1911 Taylorsville Fairfield Twp CO F 38th IA VOL. Son of Jehoiakim W. Burgett 1799/Delaware.Co.NY-?/? & Catherina Ann Sarissa Patterson 1810/NY-1883/Rockford.IL. Ch; AndrewE, WmO, Sybil, Delos(son). Burget Lucinda Gwinda Voshell Burget Wm O. 1869/Fairfield.Twp-1932/Fairfield.Twp 22 Oct 1869 2 Sep 1937 Taylorsville Fairfield Twp Dau of Killen M. Voshell 1829/DE-1908/Fairfield.Twp & Thankful Perkins 1838/Jackson.Co.IA-1906/Fairfield.Twp. Ch; Ralph. Burget Ralph Burget Burget son of Wm O. 16 Jan 1892 16 Jan 1892 Taylorsville Fairfield Twp Son of Wm. O. Burget 1869-1932, Fairfield.Twp & Lucinda Gwinds Voshell 1869-1937, Fairfield.Twp. Burget William O Burget Voshell Lucinda Gwinda 1869/Fairfield.Twp-1937/Fairfield.Twp 5 Oct 1869 13 Jul 1932 Taylorsville Fairfield Twp Son of Geo Burget 1832/OH-1911/Fairfield.Twp & Cordelia Bullis 1848/Rockford.IL-?/? Ch; Ralph. Burget Eli Burget Suspect son of John Wesley1842. abt 1861 Feb 1887 Dunham Grove Center Twp Age 15yr. Possibly son of John Wesley Burget b.1842, d. abt 1863 in the Civil War, as fits no other Burget of the John1810 line, bz/2012. Pooler Caroline Carrie May Burget Pooler Charles Lewis, 1857/Chickasaw.Co.IA-1947/Fayette.IA Oct 23, 1847 Nov 11, 1920 Grandview Fayette Sec B, Lot 219, 3ft N side, burial #1307. Dau of John Burget 1810/OH-1885/Fayette/IA & Leah Bradford 1809/VA-1890/Fayette.IA. No children. Husb. Charles would remarry Carrie Burget's Grand-neice of the same given name in 1921, bz/2012. Pooler Charles Lewis Pooler Burget Caroline May 'Carrie' 1847/IN/1920/Fayette.IA, 1st wf; 2nd wf (grand/neice of 1st wf & named after), Caroline May 'Carrie' Miller 1901/IN-1969/Fayette.IA, buried with 2nd husb Artie Crawford, sec B, lot219. Nov 1857 Mar 17, 1947 Grandview Fayette Sec B, Lot 219, burial #2138. No known children. Second wife was Grand-niece of first and named after her G/aunt; her 2nd husb was Arthur R. 'Artie' Crawford ?/?-1964/Fayette; parents Edwin Wesely Miller 1866/IN-1945/IL & Lucy Ellen Stevenson 1871/KS-1944/IN. Charles Pooler attended Hurd's Business College of UIU, clerked for Scobey, was then a merchant on Main.St. Fayette.IA, living his entire life in a house/acreage in the Westfield area on west Water.St, where he also fruit/truck gardened, bz/2012. one in the Fayette area, the other in the Arlington area. Trees were created from online, census, burial info/data so there will be speculations/best guesses. the line in the Fayette, Randalia, Dunham Grove area.
. 4 BURGET, John b: 09 Jan 1810 in OH d: 19 Nov 1885 in Fayette, Fay.Co.IA Burial: 21 Nov 1885 Grandview Cem, sec B, lot 219, burial #458, Fayette, Fay.Co.IA. Note 7: Abt. Mar 1870 Pulaski.Co.IN to farm in Westfield.Twp, Fay.Co.IA. Note 8: Jun 1870 Census; farming, $3k/200, Westfield.Twp, Fay.Co.IA. Note 9: Jun 1870 John Burget61, Leah59, Caroline May Burget21 (would marry CharlesL Pooler), Eddie Miller4, Justin Miller2. Note 10: Jun 1870 Eddie(Edwin) Miller age4, it would his dau Caroline May 'Carrie' (b.1901) niece of Carrie Burget, who would be the 2nd wf of CharlesL Pooler, bz/2012. Note 11: 1880 Census; retired farmer, Fayette, Fay.Co.IA, John66, Chleo64, Carrie29. Note 13: 1885 Census; cattle dealer, Water.St, Fayette, Fay.Co.IA, John75, Leah73, Carrie32. Note 29: Cause of death; heart, 2m, listed dropsy, relative Mrs. Charles Pooler. ..... +BRADFORD, Leah b: 1815 in VA (or MD?) d: 12 Jan 1890 in Fayette, Fay.Co.IA Burial: 14 Jan 1890 Grandview Cem, sec B, lot 219, burial #544, Fayette, Fay.Co.IA. m: 12 Sep 1833 in Madison Co, OH Father: Elisah BRADFORD Mother: Sally SCOFIELD Note 22: Cause of death; listed old age, relative Mrs. Chas. Pooler. .... 6 BURGET, Eli (suspect) b: Abt. 1861 in Fay.Co.IA? d: Feb 1887 in Westfield or Center.Twp, Fay.Co.IA. Burial: Dunham Grove Cem, Center.Twp, Fay.Co.IA. Note 9: Suspect this is the son of JohnW Burget who died in the Civil War, bz/2012. Note 10: There seems to be no other 'fit' for Eli other than son of JohnW b.1842, bz/2012. ... 5 BURGET, Eli Lewis b: 21 Nov 1843 in Pulaski.Co.IN d: 12 Oct 1927 in Fayette, Fay.Co.IA Burial: 12 Oct 1927 Grandview Cem, sec D, lot 335, burial #1495, Fayette, Fay.Co.IA. Note 8: 1870 Census; farming, $3k/1200, Westfield.Twp, Fay.Co.IA, Eli26, Mary23, Lewis4, John1. Note 11: 1880 Census; farming, Westfield.Twp, Fay.Co.IA, Eli36, MaryM32, Eddie14, JohnW11, EarnestM9, Nellie4. Note 12: 1885 Census; farming, sec 20, Westfield.Twp, Fay.Co.IA, Eli41, MaryM37, LouisE18, JohnW15, ErnestM13, NellieM9. Note 13: Dec 1886 Moved from farm into Fayette.IA. Note 16: 1895 Census; farming, Fayette, Fay.Co.IA, Eli51, MaryM47. Note 18: 1900 Census; Fayette, Fay.Co.IA, Eli, MaryM, 4ch-3living. 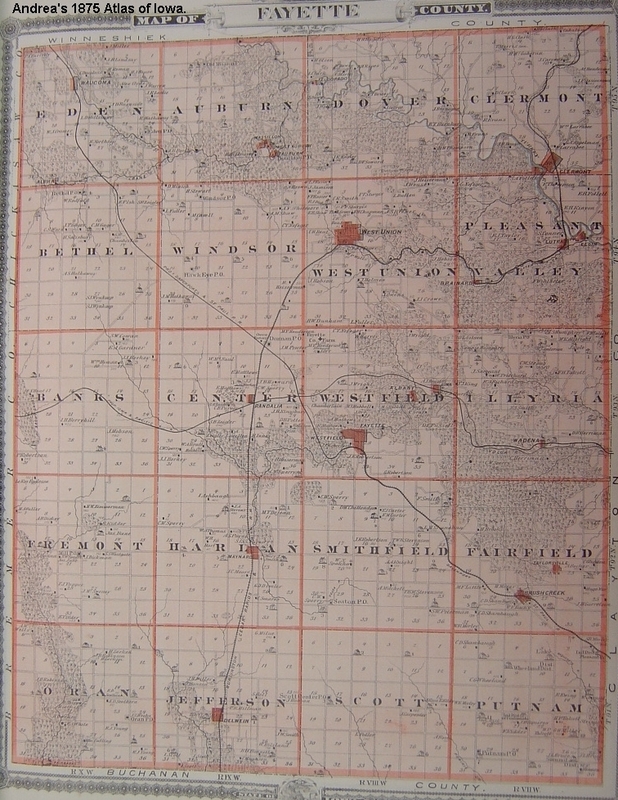 Note 20: 1910 Census; odd jobs, living S of Dr. Baker hm, on Main.Twp, Fayette, Fay.Co.IA, Eli, MaryM. 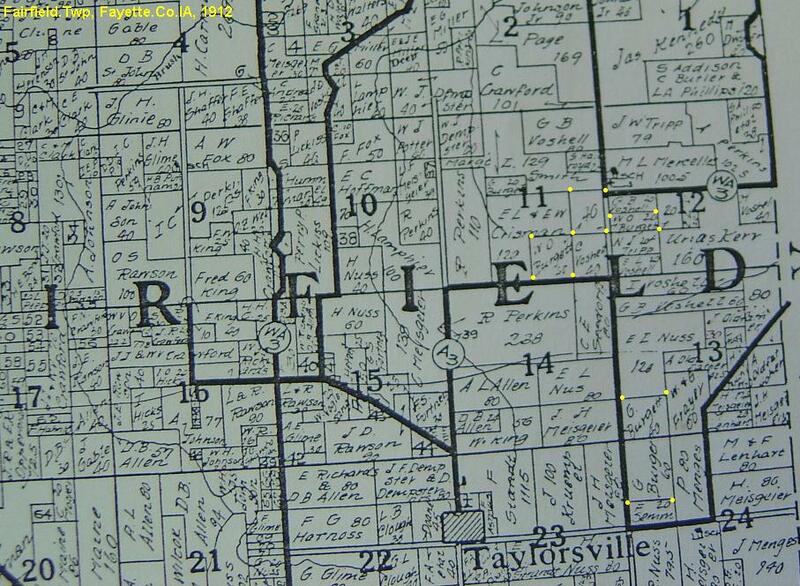 Note 22: 1920 Census; Main.St, Fayette, Fay.Co.IA. Note 29: Cause of death; listed neisosthemia, relative J.W. & Ed Burget. ....... +ASHBY, Mary Matilida b: 16 Nov 1847 in Tippecanoe.Co.IN d: 31 Mar 1939 in Fayette, Fay.Co.IA Burial: 02 Apr 1939 Grandview Cem, sec D, lot 335, 2 from N, burial #1909, Fayette, Fay.Co.IA m: 06 Jun 1865 in Jasper Co, IN Father: Job ASHBY Mother: Eliza Ellen CAVE Note 22: Cause of death; influenza, age 91. .... 6 BURGET, Lewis 'Lorin' Edwin b: 11 Apr 1865 in White.Co.IN d: 07 May 1936 in Sec 20, Westfield.Twp, Fay.Co.IA Burial: 10 May 1936 Grandview Cem, sec D, lot 338, N side, burial #1729, Fayette, Fay.Co.IA. Note 9: 1895 Census; farming, Westfield.Twp, Fay.Co.IA, Lewis Edwin28, wf JosephineM25, bro John Wesley Burget25. Note 11: 1900 Census; farming, Dunham Grove area, Center.Twp, Fay.Co.IA, LewisE34, Josie31/CT (father Eng, mother CT), Thelma2, f/law John Spatcher79 Note 14: 1910 Census; feed mill miller, Mechanic.St, Fayette, Fay.Co.IA, LewisE44, JosieM41, ThelmaP12, HarleyL9, DonaldC7, HaroldC6. Note 17: 1925 Census; Fayette, Fay.Co.IA, L.E.55, Josie56, Donald22, Clifford21. Note 28: Buried under Lorin Edw in Grandview burial book, cause apoplexy, bz/2012. ........ +SPATCHER, Josephine 'Josie' May b: 14 Aug 1868 in Iowa (Fay.Co) ?dua of Skinner or Spatcher? d: 09 Mar 1949 in Hm. of son Donald in Fayette, Fay.Co.IA. Burial: Grandview Cem, sec D, lot 338, 2nd from N, burial#2189, Fayette, Fay.Co.IA. m: 11 Apr 1887 in Fayette, Fay.Co.IA Father: John J. SPATCHER Mother: Martha J. TAYLOR Note 3: Issues determining father? Skinner or Spatcher, decided to list as Spatcher, building marriages/trees as result, bz/2012. Note 4: Mother was Martha J. nee Taylor, married 1st to Unknown Skinner, 2nd to John Spatcher. Note 8: 1870 Census: listed as Josie Skinner, with JohnJ Spatcher painter & 2nd wf Martha J. nee Taylor Skinner, Middletown.CT. Note 9: 1870 Spatcher ch; Ed1858/CT, Emma1865/CT, ChasH1857/CT; 2nd wf MarthaJTaylor Skinner1843/CT & Skinner ch, ClaraE1862/CT, RolandJ1864/CT, JoseiM1868/IA. Note 11: 1880 Census; JohnJ Spatchen 50y/Eng, painter, wf MarthaJ40/CT, CharlesH23/IA, JosopheneM13/IA, ArthurL5/IL, CoraM1/IA, step/son Roland Skinner17, Fayette, Fay.Co.IA. Note 12: 1880 Listed as a Spatcher, rather than Skinner as in 1870?? Note 13: Bet. 1886 - 1887 Finished degree at UIU in Fayette.IA. Note 14: 11 Apr 1887 Marriage license: age 19/Fayette.IA, married Edwin Wesley Burget, age22/Fayette.IA, son of Eli Burget & Matilda Ashby. Note 15: 11 Apr 1887 Married at Fayette.IA, parents listed as John Spatcher & M.J. Taylor. Note 28: Cause of death; listed carcinoma of colon. ..... 7 BURGET, Thelma P. b: 22 Jul 1898 in Dunham Grove area, Center.Twp, Fay.Co.IA d: 02 Jun 1948 in Maywood, Los Angeles Co, CA Burial: Maywood.CA Note 8: Graduated from Fayette.IA H.S. & attended UIU. Note 10: Taught several yrs in ND. Note 14: 1938 Living in Edmore.ND. Note 15: Abt. 1944 Moved Edmore.ND to Maywood.CA. Note 22: Cause of death; stroke. 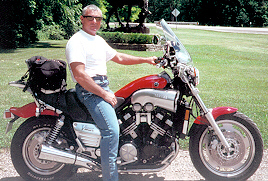 ..... 7 BURGET, Harley L. b: 1901 in Dunham Grove area, Center.Twp, Fay.Co.IA Note 8: 1948 Living in CA. ..... 7 BURGET, Donald Clyde b: 1902 in Dunham Grove area, Center.Twp, Fay.Co.IA d: 17 Mar 1985 in Ankeny, Polk.Co.IA Burial: Grandview Cem, sec D, lot 338, burial #3126, Fayette, Fay.Co.IA. Note 11: Lived on south Mechanic.St, Fayette.IA. Note 12: Worked 20yrs for the highway dept. ......... +SAMPSON, Clara Christina b: 15 Jan 1906 in Clermont area, Clermont.Twp, Fay.Co.IA d: 05 Dec 1994 in Sunnyview Care Center, Ankeny, Polk.Co.IA Burial: Grandview Cem, sec D, lot 338, burial #3289, Fayette, Fay.Co.IA. m: 24 Apr 1926 in Independence, Buchanan.Co.IA Father: Lars A. SAMPSON Mother: Dora JOHNSON Note 7: Worked UIU food service in Fayette.IA 11yrs, retired to Colesburg.IA, later to CA. ....... 8 BURGET, Robert L. Note 9: 1966 Living at Butte.MT. ........... +LARSON, Hazel m: in Minneapolis.MN Note 11: From Winthrop.MN at time of marriage. ....... 8 BURGET, Betty Note 8: 1966 Living at San.Diego.CA. ....... 8 BURGET, Ronald Note 8: 1966 Living in Cedar.Rapids.IA. ....... 8 BURGET, Helen Jo Note 5: Graduated from Clermont.IA H.S. Note 8: 1966 Teaching at West Central H.S. in Maynard.IA. ....... 8 BURGET, Dorothy Note 8: 1966 Living in Long.Beach,CA. 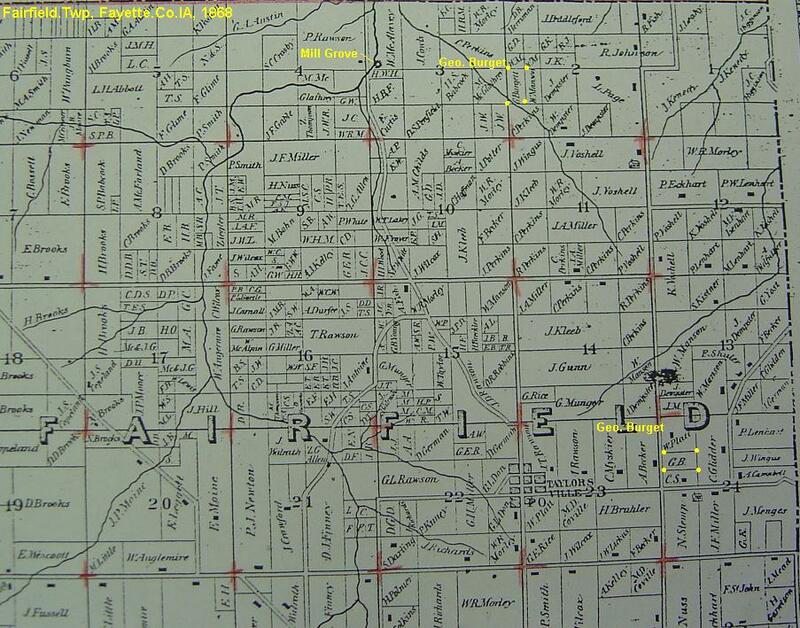 ..... 7  BURGET, Harold Clifford b: 1904 in Dunham Grove area, Center.Twp, Fay.Co.IA Note 8: 1948 Living in CA. ......... +WELSH, Phyllis Jane m: 1939 Note 8: Jul 1941 Filed for divorce & custody of 1y old dau. ....... 8 BURGET, Marlene b: Abt. 1940 Note 6: Had seven children. Note 8: Lived in Independenc.IA. .... 6 BURGET, John Wesley b: 22 Apr 1869 in Westfield Twp, Fayette Co, IA d: 14 Oct 1948 in Hm. in Fayette, Fay.Co.IA Burial: 16 Oct 1848 Grandview Cem, sec D, lot 337, burial #2178, Fayette, Fay.Co.IA. Note 6: Attended Fayette.IA schools & UIU. Note 8: 1895 Census; farming, with bro Lewis, Westfield.TWp, Fay.Co.IA. 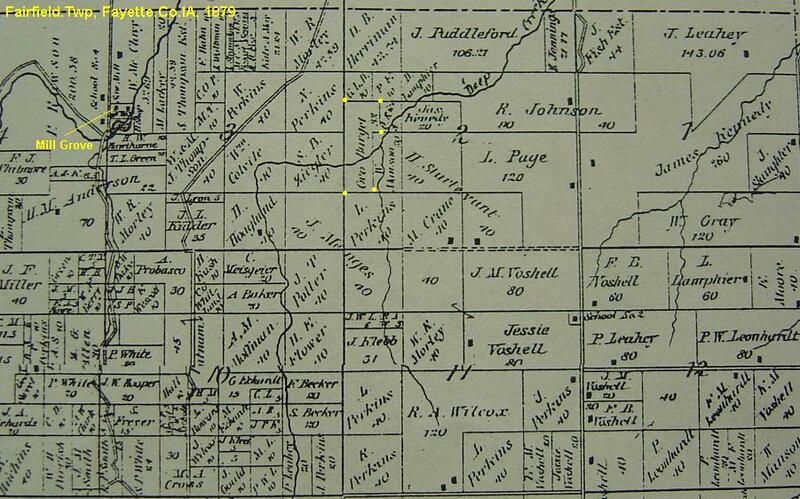 Note 10: 1900 Census; farming, Westfield.TWp, Fay.Co.IA, John Wesely, Bertha, Bernice. Note 11: Mar 1904 Moved onto Stepp's 'melon' farm, 2mi N of Fayette.IA. Note 12: 1910 Census; house/barn carpenter, Washington.St, Fayette, Fay.Co.IA, John40, Bertha32, Bernice12, Doris5, Babe1. Note 22: Work; taught school, farmed, auto dealer, real estate & insurance. Note 29: Cause of death; listed perimetha abscess, relative Chrystal. ..... 7 BURGET, Bernice b: Nov 1897 in Westfield.Twp, Fay.Co.IA Note 8: 1948 Living at Perry.IA. ..... 7 BURGET, Doris Llucille b: 15 Jan 1905 in Westfield.Twp or Fayette village, Fay.Co.IA d: 08 May 1918 in Fayette, Fay.Co.IA Burial: Grandview Cem, sec D, lot 337, 5ft from N side, burial #1238, Fayette, Fay.Co.IA. ..... 7 BURGET, Crystal b: 14 Aug 1908 in Fayette, Fay.Co.IA d: 1976 in Waterloo, Bk.Hawk.Co.IA Note 9: Taught various NE Iowa towns & Waterloo West Jr. High. Note 11: Jan 1967 Retired from KXEL Radio after 10yrs. .... 6 BURGET, Ernest M. b: 02 Jul 1871 in Wesfield Twp, Fayette Co, IA d: 31 Dec 1886 in Fayette, Fay.Co.IA Burial: Grandview Cem, sec B, lot 219, burial #478, Fayette, Fay.Co.IA Note 9: Paper; died after short illness of sudden violence, 3wks after family moved from farm into Fayette.IA. .... 6 BURGET, Nellie M. b: Abt. 1872 in Wesfield Twp, Fayette Co, IA Note 8: 1948 Living at Colorado Springs, CO.
... 5 BURGET, Caroline May 'Carrie' b: 23 Oct 1847 in Rensselaer, Jasper.Co.IN d: 11 Nov 1920 in Fayette, Fay.Co.IA Burial: Grandview Cem, sec B, lot 219, 3ft N side, burial #2138, Fayette, Fay.Co.IA. Note 14: 1920 Very sick with gribbe that last months of life, nieces Carrie & Bertha Miller of Wolcott.IN cared for. Note 15: 1921 After death, husb Charles Pooler married Carrie Burget's Grand-niece, Carry nee Miller, bz/2012. ....... + POOLER, Charles Lewis b: Nov 1857 in Bradford, near Nashua, Chickasaw.Co.IA d: 17 Mar 1947 in Fayette, Fay.Co.IA Burial: Grandview Cem, sec B, lot 219, burial #2138, Fayette, Fay.Co.IA. m: 29 Oct 1885 in Fayette, Fay.Co.IA Father: Ensign O. POOLER Mother: Fanny HORTON Note 7: 1880 Census; clerk in Geo. Scobey's dry goods, Fayette, Fay.Co.IA. Note 8: 1885 Census; merchant on Main.St, Fayette.IA, Charles & wf Carrie nee Burget. Note 9: Major merchant in 'Pooler building' on Main.St Fayette until early 1900's. Note 10: 1887 Ad: Pooler & Co, dealers in flour, feed, boots, shoes, tobacco, cigars, Fayette.IA. Note 13: 1895 Census; farming (fruit/truck) in Westfield village area, Fayette, Fay.Co.IA, ChasL37IA, Carrie37IN Note 14: 1900 Census; life insurance, Fayette, Fay.Co.IA, Charles & wf Carrie nee Burget. Note 16: 1910 Census; fruit farming, West Water.St, Fayette, Fay.Co.IA, CharlesL1858, Carrie nee Burget 1851/IN (fatherOH, motherVA). Note 19: 1920 Census; general laborer, West Water St (Westfield area) Fayette, Fay.Co.IA. Note 20: 1920 CharlesL62IA, Carrie May nee Burget 66IN; Grand-niece (by marriage to Charles) Carrie May Miller 18/IN, housework (father IN, mother KS). Note 21: 1921 Married Carrie May Miller (Grand-niece of his 1st wf Carry May Burget), bz/2012. Note 25: 1930 Census; Main.St, Fayette.Co.IA, Charles72, Carrie May nee Miller 29. Note 28: Lived on W. Water.St 61yrs, fruit & truck gardener, plus merchant. Note 29: Apr 1947 In West.Union.IA hosp with pneumonia 3wks, returned hm a wk. before death (cerebral hemorage). .... 6 MILLER, Edwin Wesley b: 21 May 1866 in Monticello, White.Co.IN d: 07 Dec 1945 in Momence, Kankakee.Co.IL Note 6: 1870 Census; with John & Leah Burget in Westfield.Twp, Fay.Co.IA. Note 7: 1870 John Burget61, Leah59, Caroline May Burget21 (would marry CharlesL Pooler), Eddie Miller4, Justin Miller2. Note 8: 1870 Eddie Miller, would name dau Carloine May(b.1901), who would be the 2nd wf of CharlesL Pooler, bz/2012. ..... 7  MILLER, Caroline 'Carrie May' b: 03 Feb 1901 in Monticello, White.Co.IN d: 01 Mar 1969 in Fayette, Fay.Co.IA Burial: 03 Mar 1969 Grandview Cem, sec B, lot 219, N of alley, burial #2769, Fayette, Fay.Co.IA. Note 8: 1901 Named after aunt Caroline May 'Carrie' Burget who married Charles Pooler in 1885, bz/2012. Note 10: 1910 Census; with Pooler's on W. Water St (Westfield area), Fayette, Fay.Co.IA, bz/2012. Note 11: 1920 Census; CharlesL62IA, Carrie May 66IN; niece (by marriage to Charles) Carrie May Miller 18/IN, housework (father IN, mother KS). Note 13: 1921 Married husb. of aunt Carrie Burget, after aunt died in 1920, bz/2012. Note 22: Cause of death; listed natural causes. ......... + POOLER, Charles Lewis b: Nov 1857 in Bradford, near Nashua, Chickasaw.Co.IA d: 17 Mar 1947 in Fayette, Fay.Co.IA Burial: Grandview Cem, sec B, lot 219, burial #2138, Fayette, Fay.Co.IA. m: 22 Nov 1921 in Edwin Miller home, S. Range St, Walcott, White.Co.IN. Father: Ensign O. POOLER Mother: Fanny HORTON Note 7: 1880 Census; clerk in Geo. Scobey's dry goods, Fayette, Fay.Co.IA. Note 8: 1885 Census; merchant on Main.St, Fayette.IA, Charles & wf Carrie nee Burget. Note 9: Major merchant in 'Pooler building' on Main.St Fayette until early 1900's. Note 10: 1887 Ad: Pooler & Co, dealers in flour, feed, boots, shoes, tobacco, cigars, Fayette.IA. Note 13: 1895 Census; farming (fruit/truck) in Westfield village area, Fayette, Fay.Co.IA, ChasL37IA, Carrie37IN Note 14: 1900 Census; life insurance, Fayette, Fay.Co.IA, Charles & wf Carrie nee Burget. Note 16: 1910 Census; fruit farming, West Water.St, Fayette, Fay.Co.IA, CharlesL1858, Carrie nee Burget 1851/IN (fatherOH, motherVA). 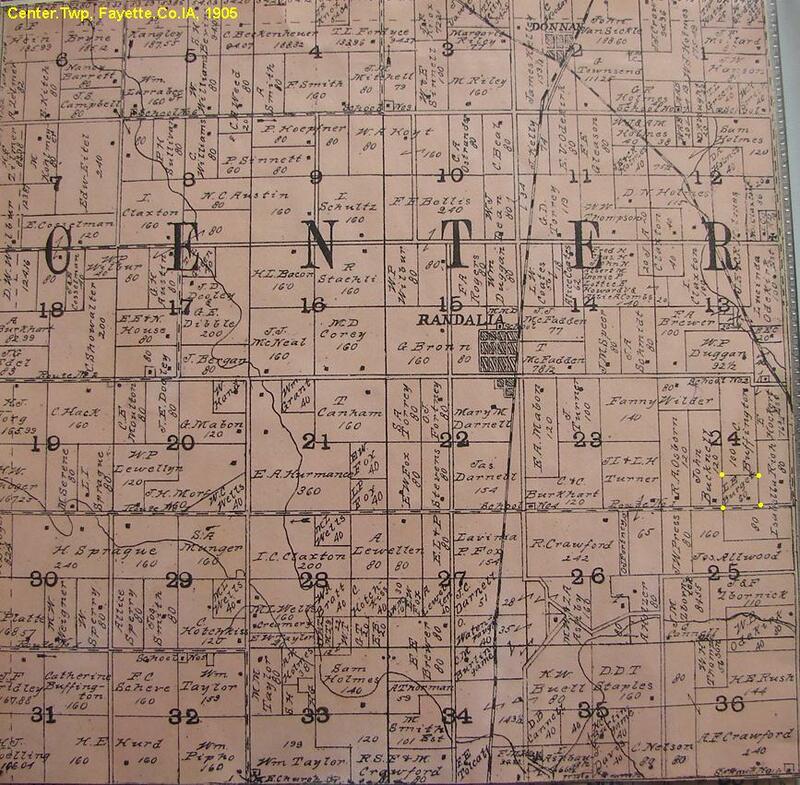 Note 19: 1920 Census; general laborer, West Water St (Westfield area) Fayette, Fay.Co.IA. Note 20: 1920 CharlesL62IA, Carrie May nee Burget 66IN; Grand-niece (by marriage to Charles) Carrie May Miller 18/IN, housework (father IN, mother KS). Note 21: 1921 Married Carrie May Miller (Grand-niece of his 1st wf Carry May Burget), bz/2012. Note 25: 1930 Census; Main.St, Fayette.Co.IA, Charles72, Carrie May nee Miller 29. Note 28: Lived on W. Water.St 61yrs, fruit & truck gardener, plus merchant. Note 29: Apr 1947 In West.Union.IA hosp with pneumonia 3wks, returned hm a wk. before death (cerebral hemorage). ....... 8 CRAWFORD, No Children? ..... 7  MILLER, Ruth Elleen b: 09 Dec 1893 in Monticello, White.Co.IN Note 11: 1969 Living in Decatur.IL. the line in the Taylorville, Brush Creek/Arlington area. 1 BURGETT, Jehoiakim W. b: 06 Dec 1799 in Harpersfield, Delaware.Co.NY Note 1: 01 Nov 2012 Burgett last reviewed: Barry.Zbornik Hannibal.MO iowazAThotmail.com Note 11: 1846 OH to Boone.Co.IL. 2 BURGET, George Burgett b: 24 Jun 1832 in Ashtabula.Co.OH d: 26 Jan 1911 in Arlington area, Fairfield.Twp, Fay.Co.IA Burial: Taylorville Cem, Fairfield.Twp, Fay.Co.IA. Note 3: 1844 OH to Boone.Co.IL with parents. 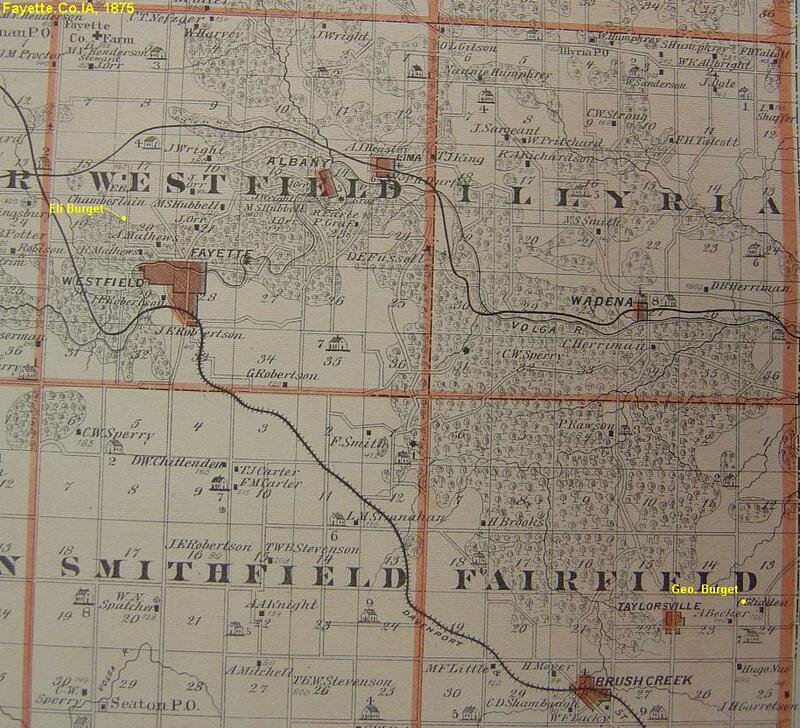 Note 4: 1855 IL to Taylorville area, Fairfield.Twp, Fay.Co.IA. Note 5: 14 Aug 1862 Enlisted, private, Co F, 38th IA Vol. Inf (from Fay.Co.IA); at Vicksburt, Pensacola, etc. 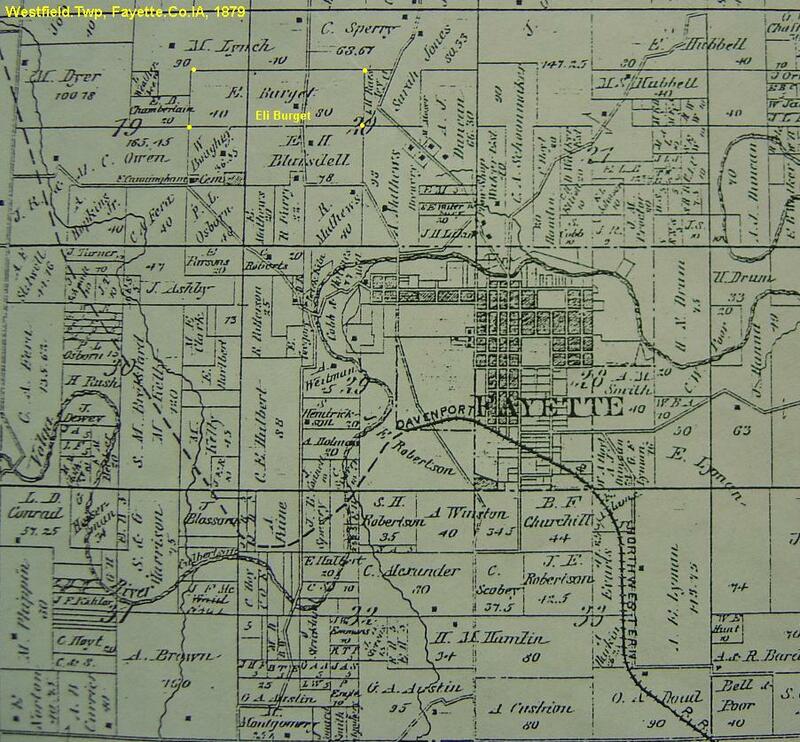 Note 6: 30 Jun 1865 Dicharged, returned to Fayette.Co.IA. 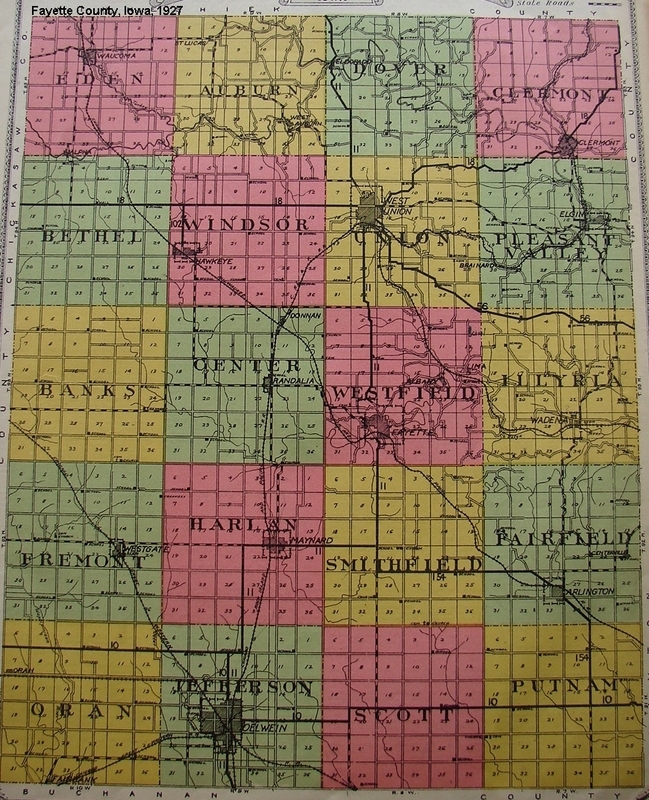 Note 8: 1870 Census; farming $2500/734, Taylorville area, Fairfield.Twp, Fay.Co.IA, Geo38, Curdlin22, Andrew3, Wm9m Note 9: 1878 Hist; farming, 112a, value $4k, sec 24, 1+mi E of Taylorville, Fairfield.Twp, Fay.Co.IA, P.O. Brush Creek. 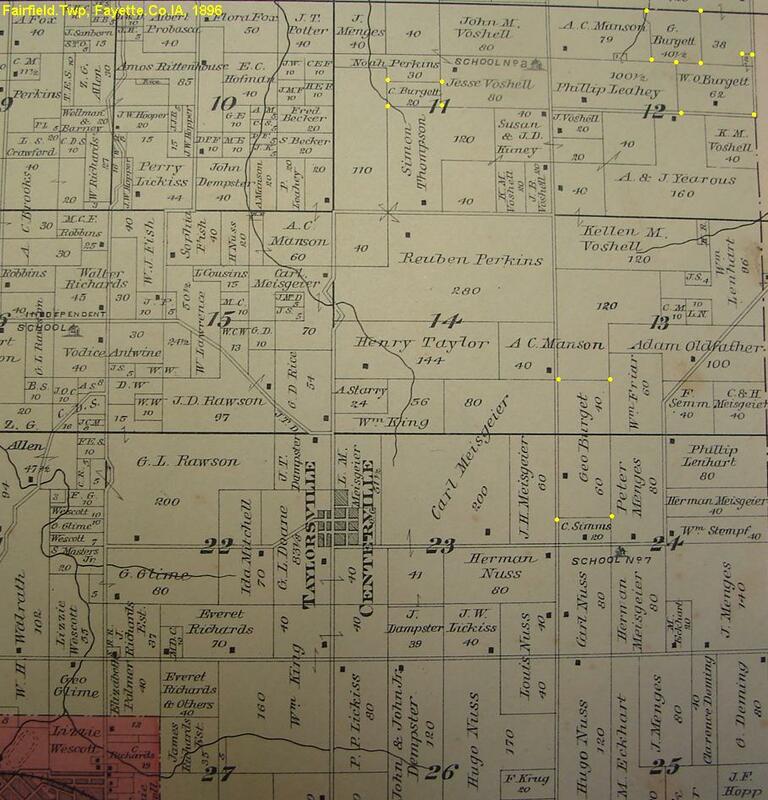 Note 10: 1880 Census; famring, Taylorville area, Fairfield.Twp, Fay.Co.IA, Geo46, Andrew13, Wm10. Note 11: 1880 ?Is Geo divorced from Cordelia or has she died (burial not listed)? bz/2012. 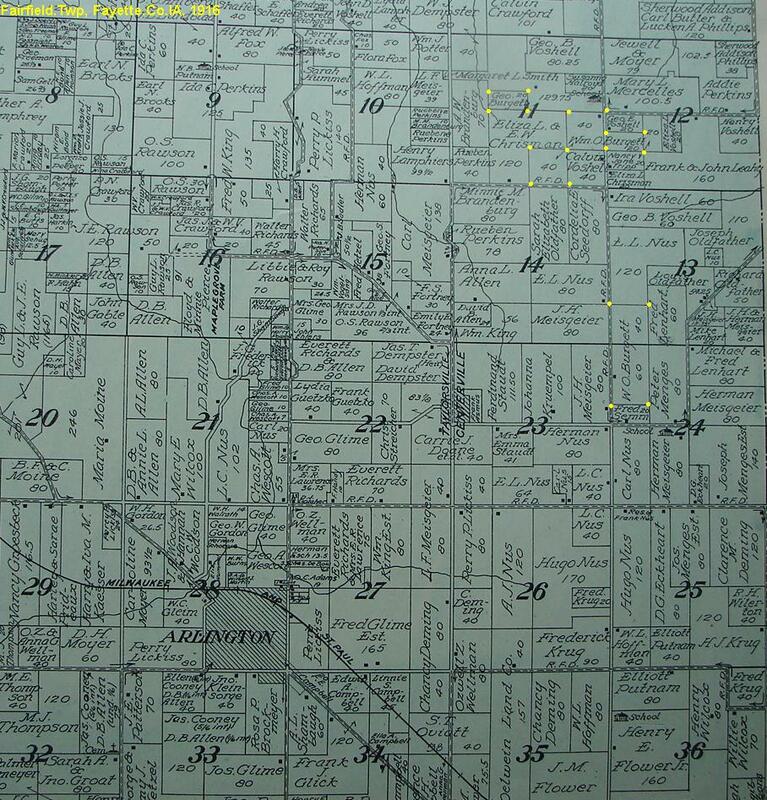 Note 12: 1885 Census; farming, divorced, Taylorville area, Fairfield.Twp, Fay.Co.IA, Geo52, Andrew17, Wm15. 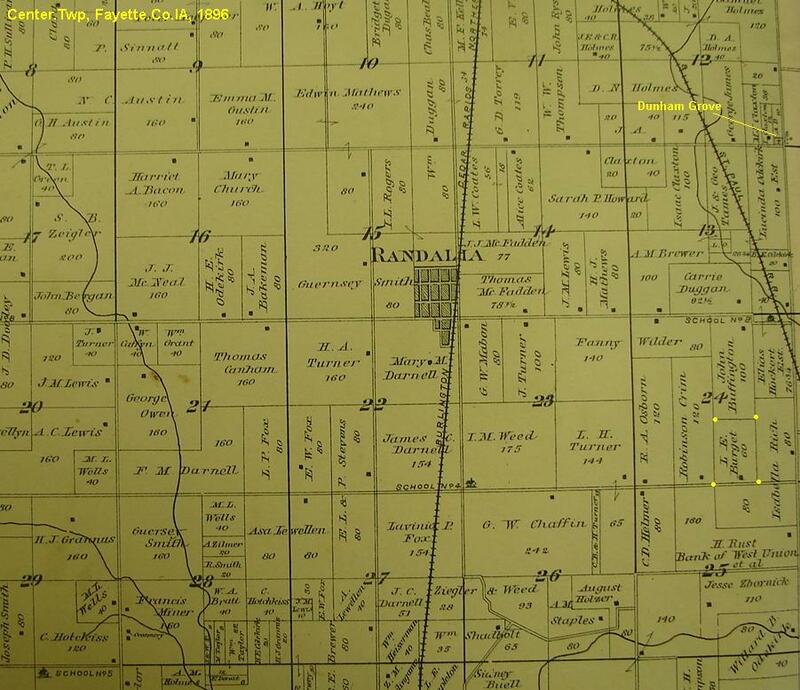 Note 13: 1885 Wf Cordelia is hired girl with Rowell family in Fairfield.Twp, Fay.Co.IA, son Delos is with her. Note 14: 1895 Census; farming, widowed, alone, Fairfield.TWp, Fay.Co.IA. 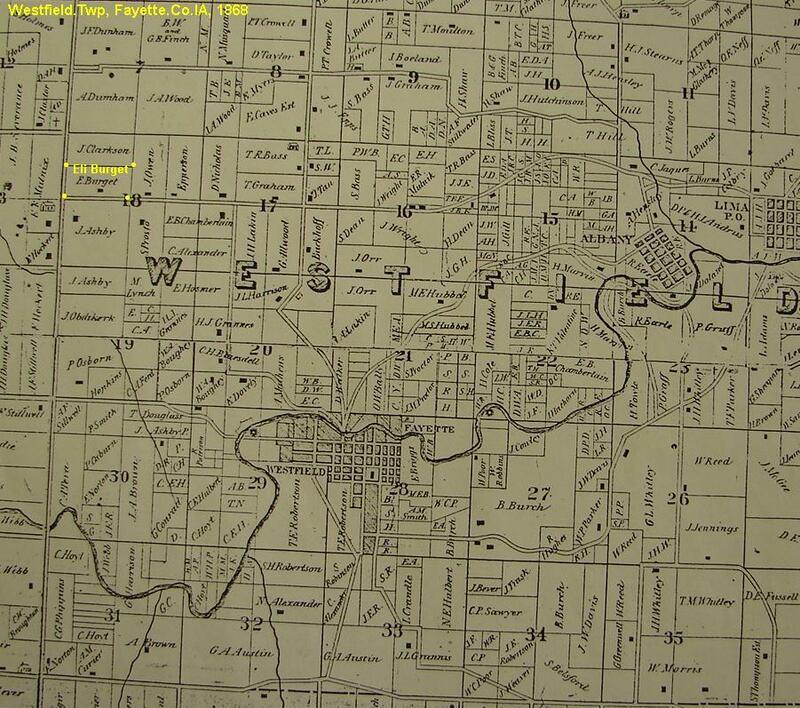 Note 16: 1900 Census; widowed, farming, alone, Taylorville area, Fairfield.Twp, Fay.Co.IA. 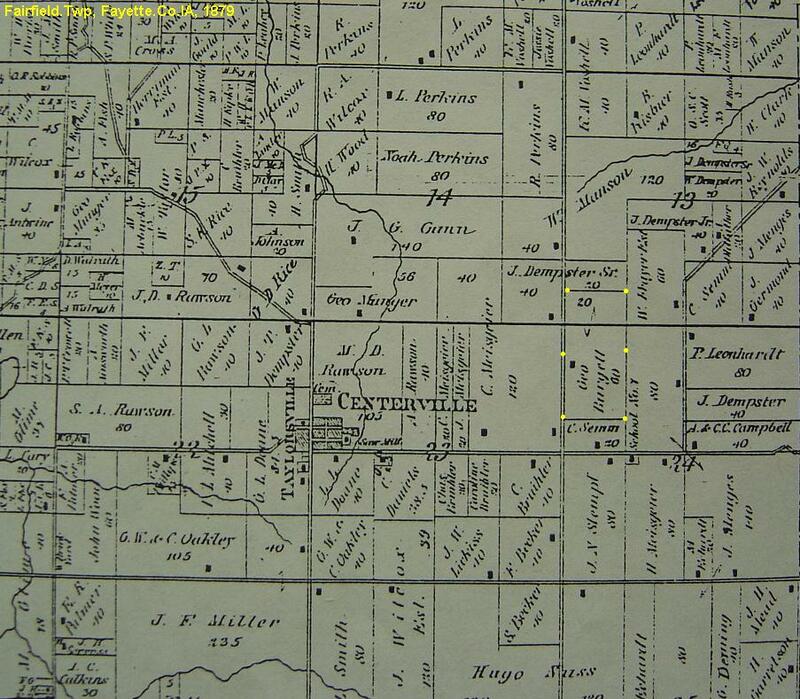 Note 17: 1910 Census; farming, widowed, alone, Taylorville area, Fairfield.Twp, Fay.Co.IA. ... +BULLIS, Cordelia Adeline b: 23 Feb 1848 in Rockford, Winnebago.Co.IL d: in Iowa Burial: Not listed under Burget in Fay.Co.IA, bz/2012. m: 25 Feb 1866 in West Union, Fay.Co.IA Father: John E. BULLIS Mother: Sybbie UNKNOWN Note 9: 1880 Husb Geo is alone with sons Andrew & Wm. Note 10: 1880 Divorced from Cordelia, son Delos is with Cordelia. Note 14: 1885 Census; divorced, hired girl with Rowell family, Fairfield.Twp, Fay.Co.IA, son Delos is with mother. 3 BURGET, William O. Burgett b: 05 Oct 1869 in Sec 24, 1+mi E of Taylorville, Fairfield.Twp, Fay.Co.IA d: 13 Jul 1932 in Taylorville area, Fairfield.Twp, Fay.Co.IA Burial: Taylorville Cem, Fairfield.Twp, Fay.Co.IA. 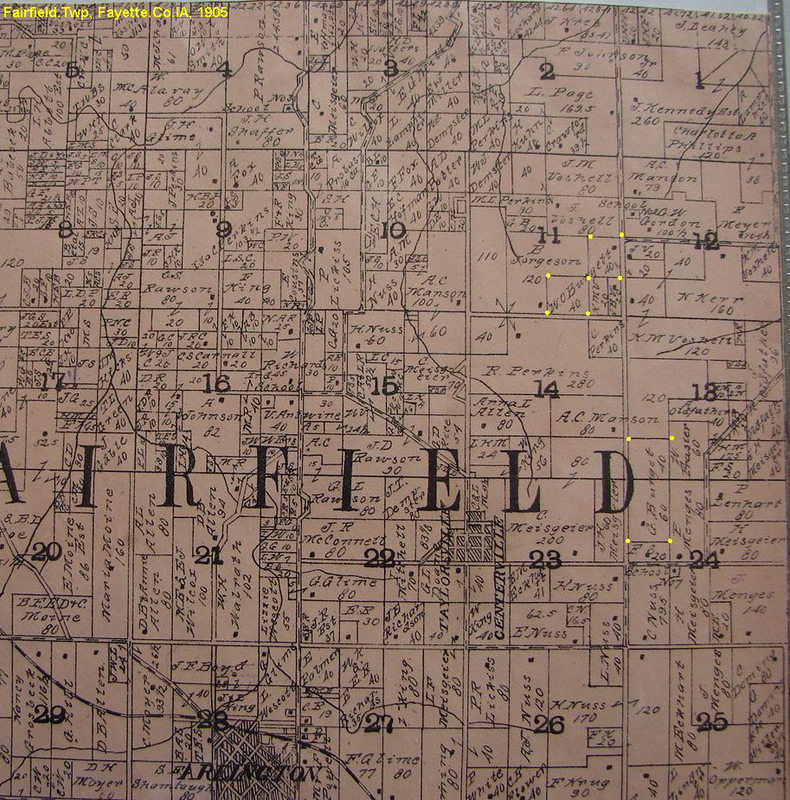 Note 9: 1895 CEnsus; famring, Fairfield.Twp, Fay.Co.IA, Wm25, Lucinda25. Note 11: 1900 Census; farming, Fairfield.Twp, Fay.Co.IA, Wm, Lucinda. Note 13: 1910 Census; farming, Fairfield.Twp, Fay.Co.IA, Wm, Lucinda. Note 17: 1925 Census; farming, Fairfield.Twp, Fay.Co.IA, Wm55, Lucinda55.
. 4 BURGET, Ralph b: 16 Jan 1892 in Fayette, Fay.Co.IA d: 16 Jun 1892 in Fayette, Fay.Co.IA Burial: Taylorville Cem, Fairfield.Twp, Fay.Co.IA. 3  DELOS BURGET b: Dec 1876 in Sec 24, 1+mi E of Taylorville, Fairfield.Twp, Fay.Co.IA d: 06 Jun 1920 in Puthan.Twp?, Fay.Co.IA Note 7: 1885 Census; with divorced mother, hired girl, Rowell fam, Fairfield.Twp, Fay.Co.IA. Note 8: 1895 Census; farm hand for Potter family, Smithfield.Twp, Fay.Co.IA. Note 12: 1910 Census; famring, Putnam.Twp, Fay.Co.IA, Delos33, Gerrie24, Evylin2. 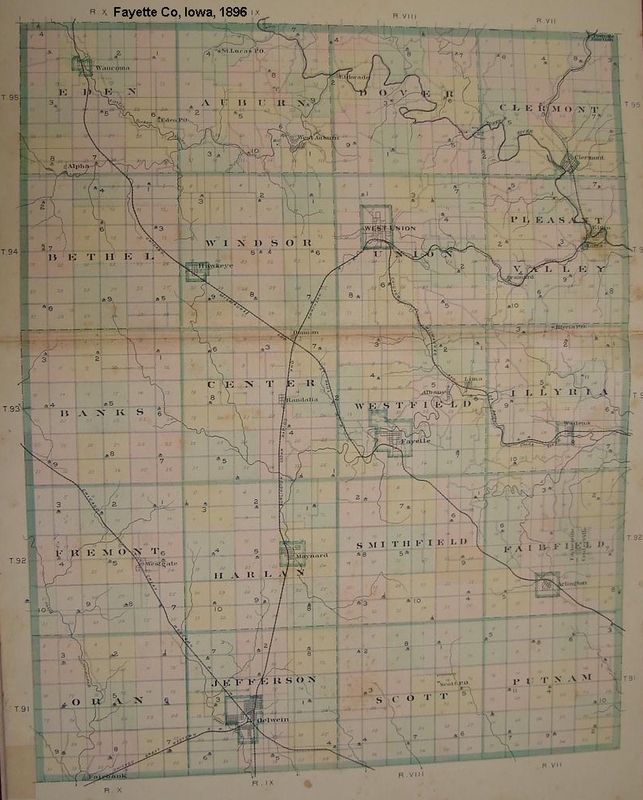 Note 18: 1925 Census; farming, widower, Putnam.Twp, Fay.Co.IA, Delos48, Evelyn16, Robert14, Fay11, Bernadean10. Maps of Burget/Burgett farms and area in chorological order.